WASHINGTON (CNNMoney.com) -- Treasury Secretary Tim Geithner made a case Wednesday for letting tax cuts for the wealthiest Americans lapse as a step toward getting the nation's fiscal house in order. "Borrowing to finance tax cuts for the top 2% would be a $700 billion fiscal mistake," Geithner said before the Center for American Progress in Washington, alongside deficit hawk Douglas Holtz-Eakin, president of the American Action Forum. "It's not the prescription the economy needs right now, and the country can't afford it." 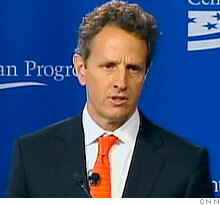 Treasury Secretary Tim Geithner addressed the Center for American Progress on Wednesday. Geithner lamented the borrowing of the last decade and talked about the need to restore a "pro-growth tax and fiscal policy, where the middle class once again has the chance to grow and prosper and where we stop passing off bills to the next generation." Lately, Geithner has made a public push to extend the Bush-era tax cuts of 2001 and 2003 for the middle class, while allowing tax the cuts to lapse for individuals who make more than $200,000 and families making $250,000 and up. Under the Obama administration's plan, the top two tax rates would revert to where they were in the late 1990s: The 35% rate would go to 39.6% and the 33% rate would go to 36%. The highest-income filers would also see their tax rates on capital gains and dividends go up. "America is a less equal country today than it was ten years ago, in part because of the tax cuts for the top 2 percent put in place in 2001 and 2003," said Geithner. "The most affluent 400 earners in 2007 -- who earned an average of more than $340 million each that year -- paid only 17 percent of their income in tax, a lower rate than many middle class families." Geithner said the government has "limited resources," and that extending tax cuts to the nation's top earners would be an ineffective way to allocate the government's money and stimulate growth. But he emphasized that failing to extend the middle class tax cuts, which save families more than $2,000 a year, would be a big mistake that would further slow the economic recovery. That's because, while the tax cuts will encourage most Americans to spend, helping to stimulate the struggling economy, top earners, with large disposable income, are much more likely to save, he said. "If the middle class tax cuts are not extended, Americans will face a sharp increase in taxes and a sharp fall in disposable income," Geithner said. "This would be irresponsible and it would be unfair, especially with America still suffering through the effects of what we learned last week was the worst recession in post-war history." Debunking 'myths': Holtz-Eakin argued that letting the tax cuts expire for the top 2% of Americans would hurt small businesses, which often pay taxes under the individual income tax code. But Geithner rejected the claim as a "myth," saying that less than 3% of small business owners would be impacted if the tax cuts expire. He also discredited the argument some politicians have made that the tax cuts pay for themselves. "There is absolutely no evidence to support it," he said. "And conservative economists and policy-makers -- even those who once hoped that this fiction was fact -- are embarrassed by the argument." On the contrary, Geithner said extending the tax cuts for top earners would be a very expensive mistake, whereas letting them expire would help to significantly reduce the deficit. "It is very important to recognize that we are still living with the scars of a very deep, traumatic financial crisis," said Geithner. "They are going to last for some time." "Future growth depends on confidence in Americans in bringing [the deficit] down," he added. Tax hikes for the rich: Can the economy afford them?